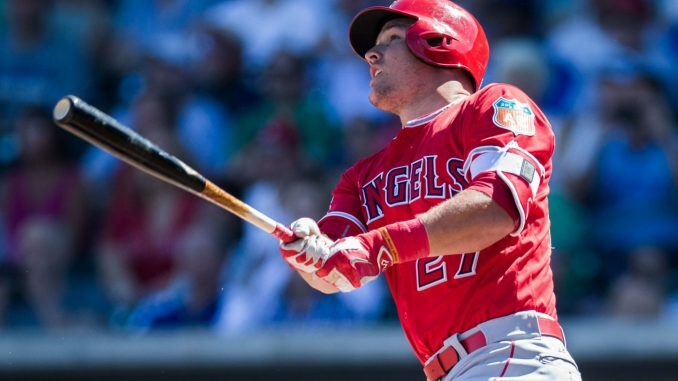 The Los Angeles Angels recently extended their superstar centerfielder, Mike Trout. Originally, his contract was set to expire in 2020, but now has an additional 10 years added on, and the 27-year-old will most likely be an Angel for the rest of his career. Angels general manager Billy Eppler was on a flight back to Phoenix for spring training when he got a text saying that Trout wanted to be “an Angel for life.” Team owner Art Moreno stepped in during the early stages of negotiations, having an hour long conversation with their franchise player. “He told us this is where he wanted to be, and we really wanted to make that happen,” Moreno said. The contract discussions were “pretty smooth” according to Eppler, and the Angels reached a deal with Trout before the end of spring training. The star centerfielder now has a 12-year $426.5 million contract. With Trout off the table in 2020, this brings the attention over to Mookie Betts of the Boston Red Sox who will now be the most sought after free agent after the 2020 season. After watching the contracts grow throughout free agency, Boston fans have been speculating what kind of deal they would need in order to keep their star player. The 26-year-old didn’t seem too concerned about it though. “We’re all different players,” he said after Harper signed. “We all have different things that are important. Good for those guys.” Betts has led the Red Sox to three consecutive division titles and a World Series championship, while being a productive player both offensively and defensively. The New York Mets and reigning NL Cy Young award winner Jacob deGrom reached a deal this past Tuesday, going against what deGrom had stated earlier this offseason, admitting he didn’t think he and the Mets would reach a deal before Opening Day. The deal is reportedly five-years, worth a total of $137.5 million. deGrom joins Justin Verlander and Chris Sale as top of the line pitchers to get contract extensions in the last week.